Regular readers know most of the cigar events we publicize at StogieGuys.com take place in the Washington area, primarily because that’s our home beat. But we recently caught wind of Cigar Artisans 2006, an upcoming event in Tampa that sounds too good to not mention. And, as an added bonus for our loyal readers, we’ve got two FREE TICKETS to give away! So be sure to drop by tomorrow when we announce the contest that will decide who scores this sweet prize. 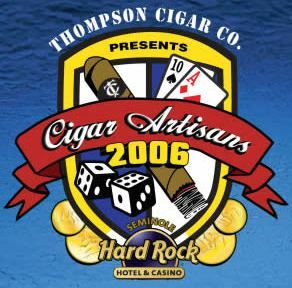 Cigar Artisans 2006, sponsored by Thompson Cigar of Tampa, brings together the most prestigious names in the cigar industry, such as Arturo Fuente, Padron, CAO, Torano, General Cigar, Altadis USA, La Gloria, Rocky Patel, JC Newman, Camacho, Gurkha, La Perla, Acid, Cusano, Oliva and more. The event consists of two sessions with identical prizes and giveaways including custom painted Harley Davidson Motorcycles, poker tables, golf bags and sets of Razor golf clubs. Ticket holders will receive 25 premium handmade cigars with a value of $150, plus other prizes worth more than $125: including an embroidered travel bag, polar fleece jacket, backpack, ball cap, cigar cutter, lighter, drawpoker and another 8 Cigar sampler. There will be food and an open bar during the event. Tickets are $110 and can be purchased through Ticketmaster or by visiting this website: www.cigarartisans.com. Cigar Artisans 2006 is taking place on Saturday, September 30. But we’ll announce how you can score two FREE TICKETS tomorrow…Right here at StogieGuys.com. See you then. The difference between Cigar Artisans and a Big Smoke is: Number one, the price is half, number two you get more free cigars, number three is the range of vendors you will meet. Some of the smaller vendors can't make it to Big Smoke events such as La Perla, Gurkha, Camacho and Oliva.